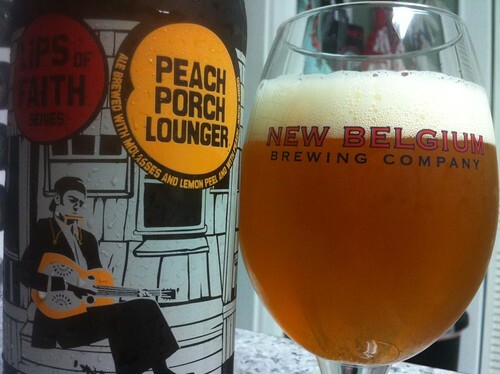 New Belgium Peach Porch Lounger | Drink. Blog. Repeat. New Belgium‘s Lips of Faith is one of those series that continually cranks of consistently solid and creative. Every batch is something new and inventive and generally a big divergence from the previous brew. Peach Porch Rocker, their collaboration with G. Love – he of Special Sauce fame – continues that trend. Marketed as a saison, PPL is brewed using grits – something that makes this Southerner smile – molasses, lemon peel and, of course, peaches. It clocks in at just north of 9%, aiding to the idea that this is a beer best enjoyed slowly whilst relaxing on your porch. The pour is a slightly hazy golden sunset orange. There’s about two fingers of a really foamy, bubbly head topping it off, along with some really strong lacing and mild alcohol legs. Best way to describe the taste? Like biting into a big ripe juicy peach. It’s incredibly rich and flavorful with big sweet and tart characteristics. Just a mild carbonation on the palate. On the back of the tongue, the citrus and bread notes are big. It develops into a sweeter note on the finish with a definite molasses character and flavorful peaches. A bit syrupy sweet, but the tartness cuts it nicely. Like G. Love’s music – or at least the couple of songs I’ve heard – PPL is a funky but smooth. The sweetness of the peaches works well cutting the funk, but the tartness also works to compliment the Brett. And true to its name, it’s certainly a porch beer, even more so now that it’s starting to feel fantastic outside. Thanks for the review! Very well written and informative. Had I not already agreed with you on this beer, you might have changed my mind… Thanks again, and I look forward to your next review!